The diamond pattern of woven wire matches continuously from panel to panel for a handsome finished appearance. 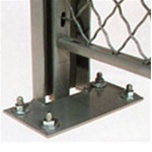 Shelving's wire partitions are the effective and economical approach to area guarding and area separation. These heavy gauge wire partitions are structurally strong to assure years of service. If your security, storage, or area guarding requirements change or expand, our wire partitions can be quickly and easily rearranged, extended or moved.